When I visited my doctor last week, I had to wait. The doctor was running just a little bit late. I had a chance, therefore, because of that, to see just where my doctor's head is at. The picture, above, a sampler on her wall, is a pretty nice way for her to tell it all. She will try to cure me, if she can. Relieving pain and distress is part of the plan. But if none of that works, and well it might not, comforting words can do a lot. The message from the sampler is not exactly the Hippocratic Oath, but it's close. It's in the same ballpark, anyway. It is comforting to know that these enumerated promises are ones to which my doctor is committed, and I appreciate the sentiments she has displayed for her patients. I appreciate, also, the basic commandment that all doctors are urged to keep: "first do no harm." 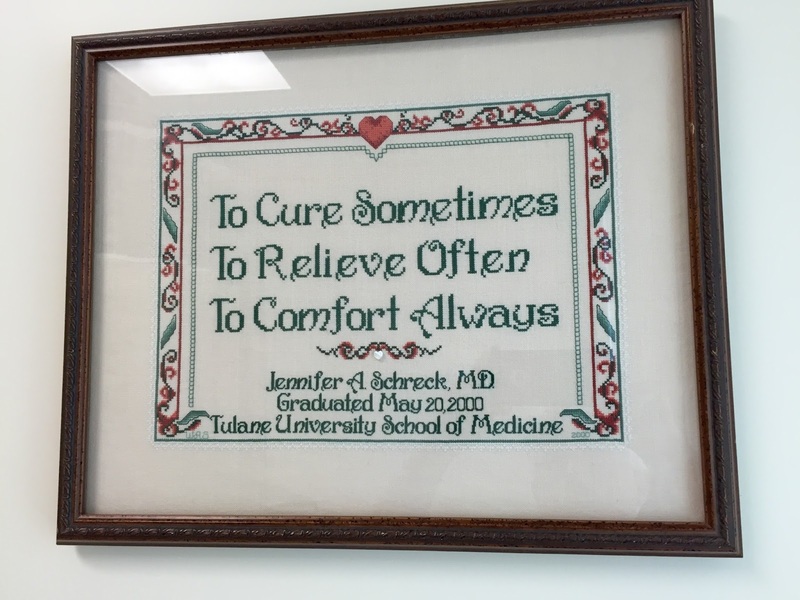 I particularly appreciated reading these sentiments on the sampler in my doctor's office since just before coming to her office I had finished reading an horrific article about modern medical practice in Belgium. That article, published in the June 22, 2015 edition of The New Yorker, was titled "The Death Treatment." The article discusses medical care in Belgium, which has a law promoting "dignified death as a human right." I am not using the word "promote" casually. The story told in "The Death Treatment" is centered on one doctor's effort to promote euthanasia to patients facing various adversities. He will be glad to kill you, if you'd like. Read the article to see if you find the incidents described as offensive as I did. The law in Belgium is not like the Oregon "Death With Dignity Act," or like Senate Bill 128, the "End of Life Option Act," which is a legislative proposal being carried by State Senator Bill Monning, currently under consideration in the California State Legislature. Both these laws provide for "doctor-assisted suicide," and facilitate the ability of a person, under certain circumstances, to be able personally to end his or her life with dignity. In Belgium, the patient is killed by the doctor directly. It also appears, at least the way the article tells the story, that there is no prohibition on a doctor's active encouragement to a patient to sign up for the "death treatment." It strikes me that a "Two Worlds" analysis might shed some light on why I have reacted so badly to the medical practices outlined in "The Death Treatment," and also why humans have historically felt that "suicide" is somehow fundamentally wrong. What we think of as our "lives" do, in fact, belong to us, and are properly under own own dominion, because the lives we live are the result of our own choices, and we are free, always, to change our choices and do something new. That is the essence of human freedom, and such freedom is at the foundation of our human world, since our exercise of our freedom is what, in fact, builds and maintains the human world in which we most immediately live. Our biological "life," though, is not something that we construct. It is a mysterious gift, and we find ourselves alive not because of anything we have done, or can do. Why we are alive remains a mystery. All the knowledge being accumulated in the biological and physical sciences has not been able to provide us with an answer to that question: "Why am I here?" Why, indeed, are any of us here? Whether we count it as a blessing or a curse to be here (and I am sticking with the "blessing" option), we do not give life to ourselves,. Why we are alive remains a mystery. We are not in charge of deciding that we will live. A recognition that our biological life comes from some source other than ourselves (and that is in fact absolutely true) has always underlain, I think, the idea that since we did not give ourselves our biological life, we should not arrogate to ourselves the right to end it. The more we get confused about whether or not we are in charge of the Natural World, which has mysteriously created us as alive, the more it is likely that we will continue to "unpick the fabric of life," even including those threads that specifically sew us into the world into which we have been born, a world we have not made, and cannot make, ourselves. Actually, the biological sciences have answered "why" question of human existence, which is also shared by all other living things on Earth. Why questions have two parts, explanation and purpose. By way of explanation, life evolved by natural selection starting from simple chemical processes in which some elements were more readily replicated than others. Life has no intrinsic purpose except for procreation. In terms of human life we make our own purpose. It happens to be objective fact that humans are capable of suicide, and so are literally in charge of deciding to live or die. Suicide is an act which harms other people who morn, have to clean up the mess, etc. This is why suicide is illegal. End of life care should include a dignified end.